The Anzac Day Clash is an Australian Rules football match between the Collingwood and Essendon teams that is played on Anzac Day each year and is preceded by a short Anzac commemoration. Note the role of Kevin Sheedy. And note that there is now an issue over restricting the match to Collingwood and Essendon. Note how the match creates an opportunity for many people to become involved in an Anzac Day commemoration and be reminded about the Anzac spirit and what it means. On the other hand, there is criticism of the clash as being an opportunity for some people to make money out of an Anzac commemoration. And there is sometimes criticism when the link is made between fighting in war and fighting to win a football match. Note how the medal links the game with the Anzac spirit. "(T)he most eagerly anticipated home and away game of the AFL season." The closeness of Anzac Day and Easter in 2019 has created a few uncertainties for the football schedule. Live stream details and summaries. As tipped, Essendon broke Collingwood's winning run of Anzac Day clashes in 2017, defeating Collingwood by 18 points. Collingwood coach Nathan Buckley identifies forward Travis Cloke's form and fitness as being critical to his participation in the forthcoming Anzac Day match against Essendon. In a 69-point victory in the 2016 Anzac Day clash, Collingwood (22 goals 10 behinds) defeated Essendon (11 goals 7 behinds). 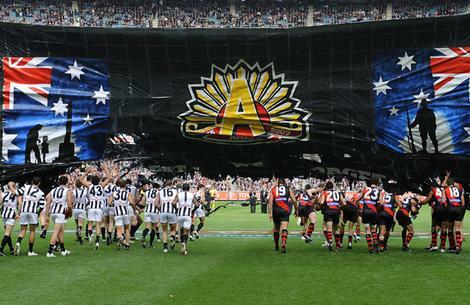 St Kilda will not be hosting a 2016 Anzac Day clash in New Zealand. Background information and program for the 2015 Anzac Day clash between Collingwood and Essendon in Melbourne. In the sixth year of the Anzac Day clash in Australia, the Collingwood football team has achieved its fifth win, defeating Essendon by 20 points. St Kilda and Carlton will face each other in an Anzac Day clash in New Zealand. In the third year of the New Zealand Anzac Day clash, the Carlton football team defeated St Kilda by 40 points. 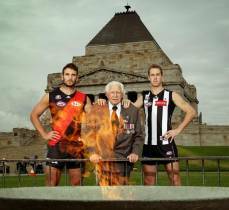 The 20th Anzac Day clash between Collingwood and Essendon will be played at the MCG on Friday. Played at the Melbourne Cricket Ground, Victoria. Won by Essendon. Played in Wellington, New Zealand. Won by the Sydney Swans. Collingwood defeated Essendon in the 2012 Anzac Day Clash. Kokoda veteran Bill Mahney will be among the soldiers from the 39th AIF Battalion who will be acknowledged before the Anzac Day Clash of 2012 begins. 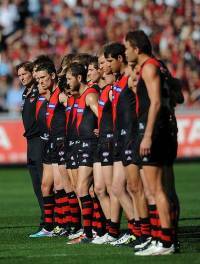 A report of the Anzac Day Clash between Essendon and Collingwood on 25 April 2011. ISSUE: Only for Collingwood and Essendon? The annual Anzac Day clash game should be rotated between the 18 clubs, sportswriter Richard Hines argues. Collingwood's coach says he has doubts over whether the Anzac Day Clash should be restricted to Collingwood and Essendon. Andrew Hamilton argues that Collingwood and Essendon must display the Anzac quality of sacrifice by allowing other teams to play in the Anzac Day Clash. 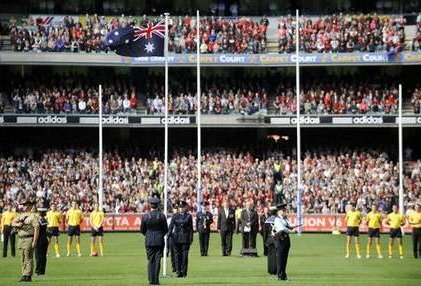 Opinion is split over whether Collingwood and Essendon should remain the only teams to play in the Anzac Day Clash. It is within the realms of possibility for Anzac Day on Friday 25 April 2014 to see three matches: at the MCG (Victoria) at 2pm, in Wellington (New Zealand) at 5pm and at Fremantle (Western Australia) later in the evening (Eastern states times). The St Kilda football team has received AFL approval to play an Anzac Day clash-style game in New Zealand in 2013. Notes about the Australian War Memorial's "Sports and War exhibitions. By Dale James Blair. From the Journal of the Australian War Memorial, Issue 28, April 1996. An academic discussion of issues relating to the link between war and sport. Peter Weir's film Gallipoli portrays a number of connections between war and sport, as summarised under 'THINGS TO NOTE', Point 1.